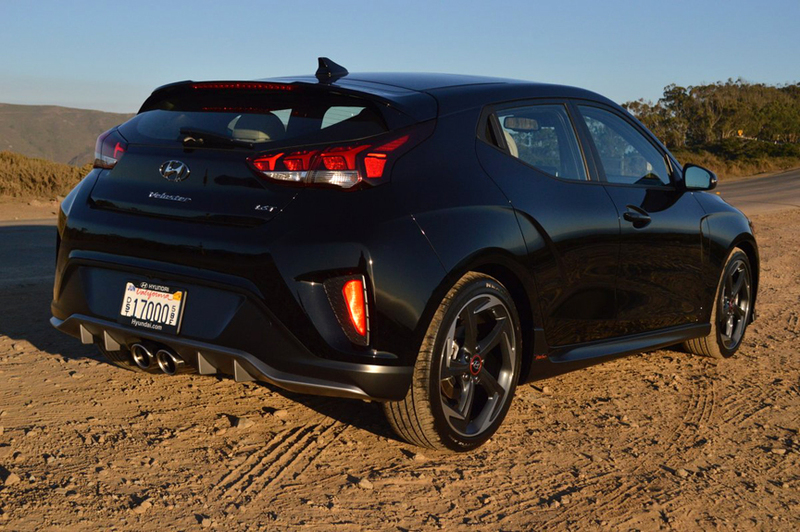 To the untutored eye, the 2019 Hyundai Veloster may look identical to the 2018 version of this quirky sport coupe. But in fact, Hyundai has completely revamped the underpinnings of the Veloster for 2019. Where previous Velosters were based on the rather bare-boned Hyundai Accent sedan, the latest derivation utilizes the much sportier platform of the Elantera GT. Visually, this change is hardly noticeable from outside or inside since overall length (155") and wheelbase (104") only grow by an inch. But the switch over to the more stable Elantera platform immediately reveals itself when you climb behind the wheel. In spirited driving, the newest Veloster enjoys greater stability than before, with more steering precision and superior handling. For 2019, you can select from three different models of Veloster. 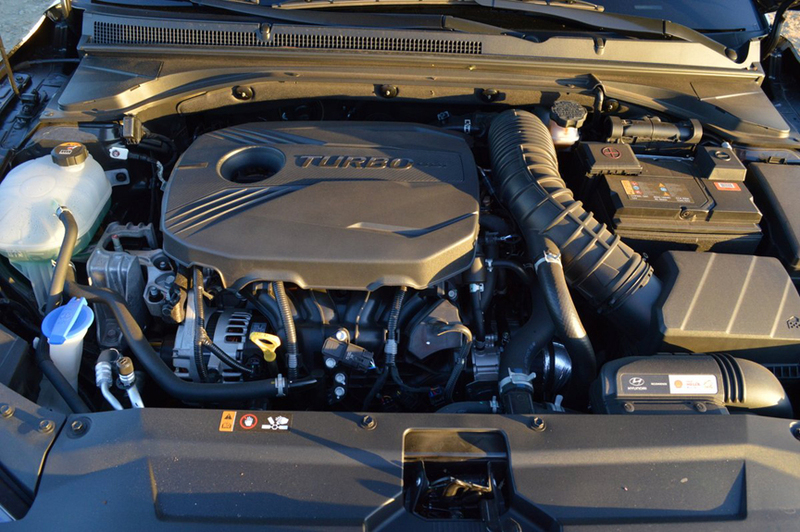 The entry level coupe uses a 2.0 liter inline 4 which produces 147hp. Our test model mated its 201hp, 1.6 liter turbocharged inline 4 to a new 7 speed dual clutch transmission with paddle shifters. Hyundai fits the 1.6 turbo with very dynamic looking 18 inch alloy rims mounting 225/40R18 Nexen Npriz AH8 radials which carry a sturdy treadwear rating of TW500. 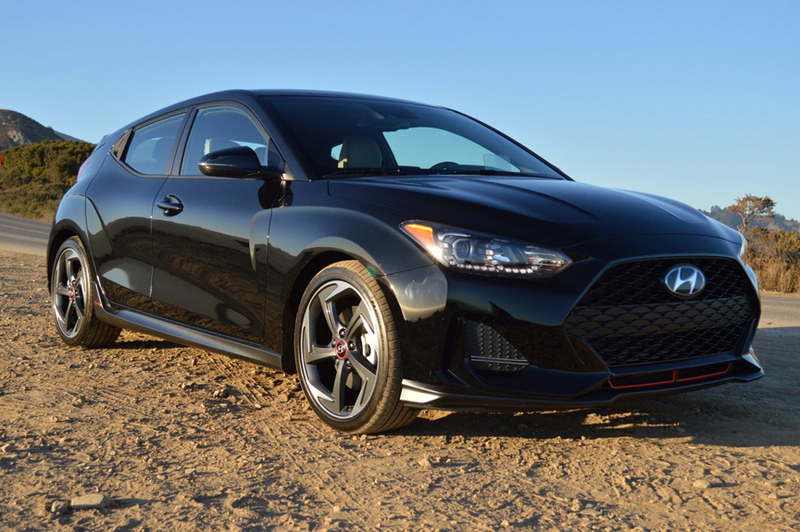 The big news for 2019, however, is the advent of a new top line high performance Veloster. For autocross and track racing junkies, a special "N" model tops the Veloster line with a turbocharged 2.0 liter inline 4 producing 275hp. This Veloster N is also equipped with 19 inch rims and mates its hefty turbo motor to a 6 speed manual transmission. Even the front-wheel-drive, 201hp Veloster Turbo we drove has more than enough power to float the front wheels when the throttle is mashed when exiting a turn. So we can only imagine what the extra 74hp of the N version might do to alter the handling equanimity of the Veloster chassis. Undoubtedly, Hyundai migrated the car's underpinnings from the Accent to the Elantera to counteract the infusion of all those extra ponies on tap in the N. But even in the rather unstressed 1.6 turbo we drove, the Veloster behaves itself with notable aplomb, taking on backroad challenges with BMW-like mastery. In particular, the racing-based double clutch gearbox responds instantly to shift commands from the paddles, helping keep the peaky turbo motor on full boil should you choose to drive with enthusiasm. Two other notable driving assists also insure precise control. A standard torque-vectoring system allocates power to the front on an as-needed basis. And to insure premium driver feedback, Hyundai offers a "Mode" button on the center console which, when dialed to "Sport," instantly tightens up steering feedback. Sport also selects higher rpm engine operation. All the right elements are amalgamated on the Turbo Veloster to make it intensely rewarding to drive hard. However, the Veloster does feel a bit nervous and noisy in Sport mode.. The antidote is available by selecting the "Normal" driving mode, where the Veloster Turbo is happy to upshift at lower rpm, while also reducing steering effort for parking and tight urban maneuvers. The interior design is particularly attractive, comfortable and eye catching. 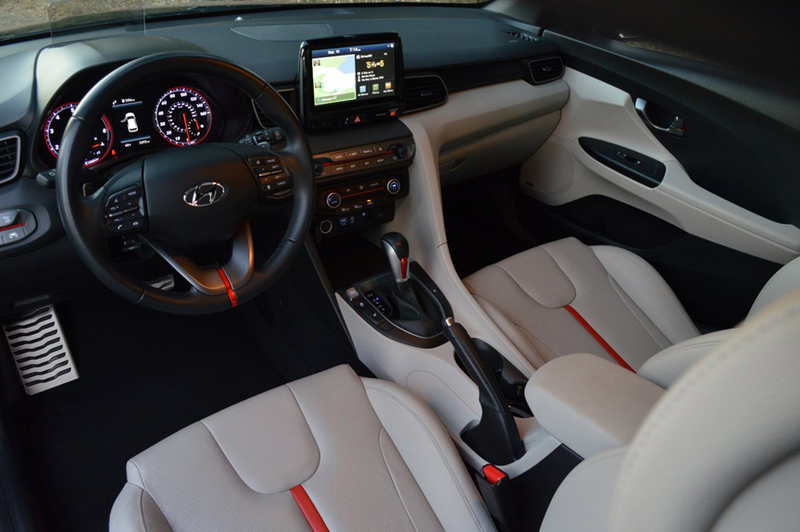 Our "Ultimate Black" Veloster was fitted with dove grey seats front and rear. The first row chairs look inviting with their red vertical stripes adding a racy note to the proceedings. The red stripe theme is carried into the face of the dash, where bold scarlet piping leads to the push starter button. Even the console mounted stick shift sports a red slash across the top of the knob. One of the most endearing features of the Veloster has always been its third curbside rear door which can only be opened when the front passenger door is also open. This miraculous invention allows you or your passengers to access the tight confines of the rear seat with ease and grace. Mazda utilized a similar setup on their 2+2 RX-8 sports car back in 2004, and it great to see this imaginative design resurface on the Veloster. Our test car also featured an 8 inch Navigation screen which not only displayed AM/FM/HD/SiriusXM radio selections, but also supports Android Auto and Apple CarPlay. If you are in the market for an affordable, fun sports coupe offering exceptional high performance for minimal investment, the ingeniously designed Hyundai Veloster Turbo should be high on your candidate list.